This online course compliments the information covered in the On-Site Guide to the 18th Edition IET Wiring Regulations (BS 7671:2018) and is now available at a new lower price. The course will prepare learners to be able to apply the requirements 18th Edition of the IET Wiring Regulations in their work, for the safe use and operation of electrical equipment and systems. If you and/or your company are interested in purchasing a suite of Wiring Regulations products and services, including books, digital subscriptions and training, contact academy@theiet.org to discuss discounted options. 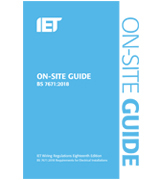 The On-Site Guide provides practical information on applying the requirements of BS 7671. The handy A5, spiral bound book is easy to take out on the job and reference as needed. This book has been fully updated to BS 7671:2018. •Apply the requirements 18th Edition of the IET Wiring Regulations in your work, for the safe use and operation of electrical equipment and systems. This course is designed for electrical installers, designers, specifiers, and those working in the inspection and testing of electrical equipment. Malcolm Doughton is a consultant engineer and sits on the JPEL 64 panel that oversees the development of BS7671.